What is Cardboard Colin going to dress as for Halloween this year? I’ve made some options so you can help me choose! Comment to vote for your favourite and on October 31st I’ll post a Halloween comic featuring Colin in the most popular costume. Also you can buy the original collages of the costumes in my shop! 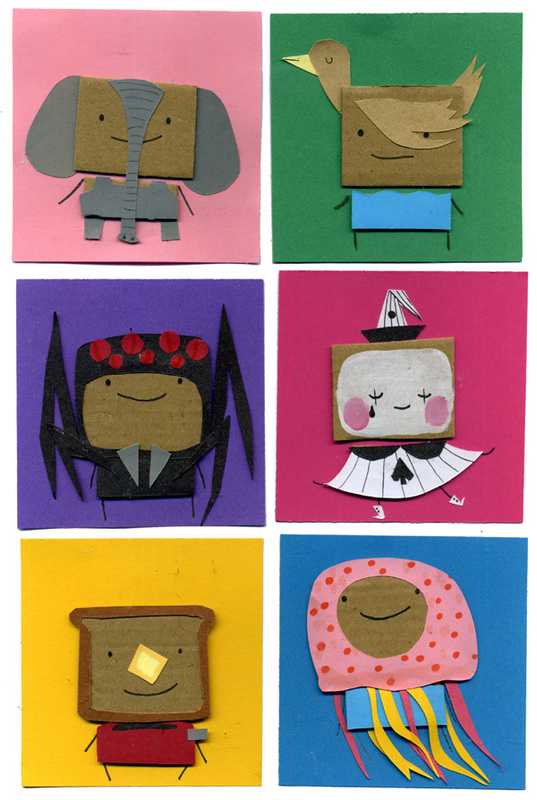 Elephant, Duck, Spider, Pierrot, Toast and Jellyfish. You can name more than one costume if you like. Every vote counts! You can’t beat the awesome power of TOATS. Bread and butter for sure!! I vote for the clown! TOAST! I’ll vote for hot buttered toast in just about any election. Elephant, but only if he has a little elephant tail. Pierrot, Toast and Jellyfish. All of these are awesome. TOAST! The toast is amazing! We have one vote for elephant, and one vote for toast!! The Spider is pretty cool. I think he should go with the spider. i love the toaster! also the duck and water, but my vote is going to the toaster! oh! i just read the ‘okay to vote for more than one’ bit. put me down for one duck and one toaster! They are all ADORABLE. The jellyfish is super-cute but the toast is cleverer – so I’m voting toast. Toast… no, jellyfish… no toast! I love toast to death, but I gotta go with JELLYFISH. Too adorable. awwww, all of them so cute! but I vote for the duck, because it gives Colin the cutest bangs ever. He looks Superrrr cute & happy in it! How perfect (and perfectly adorable) is that spider costume, considering his recent role as spider-papa? Toast and jellyfish! NEGATIVE VOTE FOR SPIDER. spider or jellyfish – both are awesome! Duck! A thousand times duck!!! Three votes for the elephant! I love it how the trunk starts above his eyes. As it should. Spider or toast, spider or toast, spider of toast… ugh… *flips coin* SPIDER! Not many have voted for it, but I’d go with Spider. I think it suits him best. Oh I love the duck! Pierrot is cute also. The jellyfish, definitely. It looks like Pauline’s secret boyfriend. It has to be Jellyfish Colin. toast! or duck. but all of them are really good. Though I love them all! although the Pierrot makeup makes Colin look a little like a Pop Tart. I vote for the jellyfish! Toast, go for the toast. I also liked when collin earlier dressed up as a block from mario bros.
I-I like the spider. It’s wonderfully terrifying. Has to be the spooky spider! The toast. It’s gotta be the toast. Spider! It is Halloween, after all! I think Colin looks cute as a spider. Spider or Toast, definitely. The spider is -perfect- so soon after the baby spider storyline. I gotta go with the spider costume. My 8 year old son wants to vote for the Spider! I’m intrigued that the last two panels are the most popular. I wonder if there is a psychological reason for this or if it is just a coincidence. JELLYFISH. JELLYFISH. I vote for JELLYFISH. JELLYFISH shall win because its the definition of AWESOMENESS! Spider! Because what else says halloween like a spider? toast, that little nob of butter is far too cute. Actually that duck one is understatedly awesome! Duck for sure. duck duck ducky duck duck! I like the toast but the jellyfish is a close second. Secret option #7: Nyan Cat! Does no one like the pierrot? )': I voted for him like, 22 comments ago. I vote for the toast ensemble, his little toaster suit is just too clever! The pierrot is really cute, but the Jellyfish is my favorite! Pierrot or Jellyfish! Scratch that.. Pierrot FTW! I vote jellyfish. Or ALL OF THEM. My first vote is for toast, followed by the elephant. I vote toast or elephant! I’m voting toast, because it is adorable and delicious. Jelly fish or maybe the elephant I can’t choose!!!! $o$ help me!!!! He should go as a spider if his “kids” come along. I bet Colin would be happier with a Jellyfish costume. spider if it’s not too late! I love them all, but I like the clown or mime the most! Oh Pierrot Colin… we shall soon meet again… I hope. I’ve missed out on the voting, but I would’ve voted for the toast!